Ankle injuries are very common in athletes and in people performing physical work, of ten resulting in severe pain and impaired mobility. Pain after ankle injuries can either be from a torn ligament and is called ankle sprain or from a broken bone which is called ankle fracture. Ankle fracture is a painful condition where there is a break in one or more bones forming the ankle joint. 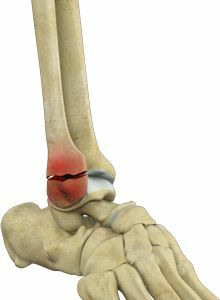 The ankle joint is stabilized by different ligaments and other sof t tissues, which may also be injured during an ankle fracture.